A HI-SEAS crew member walks in a spacesuit on EVA’s during the 2013 HI-SEAS simulated space mission in Hawaii. 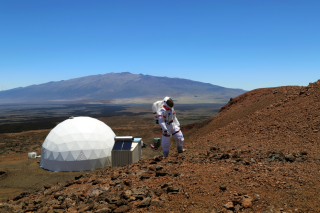 Six scientists emerged from a space habitat on Hawaii's Big Island Tuesday (Aug. 13), ending a four-month simulated mission designed to study how best to feed astronauts during the long trip to Mars. The mission, known as Hawaii Space Exploration Analog & Simulation (or HI-SEAS for short), began in mid-April and wrapped up Tuesday morning, when the six explorers stepped onto a lava field about 8,000 feet (2,440 meters) above sea level on the northern slope of Mauna Loa. During the 118-day mission, Vermeulen and his colleagues ate a variety of instant foods and also cooked for themselves using shelf-stable ingredients. They rated all of their meals and kept detailed records of their moods, body mass and health status. HI-SEAS — which was led by Cornell University and the University of Hawaii at Manoa and funded by NASA — aimed to learn more about how to keep astronauts healthy and happy during long space journeys, which can be taxing physically, psychologically and emotionally. While researchers will likely pore over the HI-SEAS crewmembers' journals for a while to come, some conclusions are already apparent to Vermeulen. Crewmembers of the HI-SEAS mock Mars mission enjoy a fresh meal after emerging from their "space habitat" on Hawaii's Big Island on Aug. 13, 2013. "Ingredients that will be essential for future space missions on Mars or the moon will include spices, herbs and hot sauce," Vermeulen told Astrobiology Magazine's Leslie Mullen during the mission. "But also comfort food such as Nutella, peanut butter and margarine. And then enough ingredients rich in fiber. The problem with shelf-stable ingredients is that they're usually highly processed and hence lacking fiber. We enjoy wheat bread, rye crackers, nuts, and dried fruits, for example." While food was the main focus of the study, the HI-SEAS crew did more than just cook and eat. For example, they ventured outside the habitat at least once per week to explore the terrain and perform geological and microbe-detection studies (donning spacesuits, of course, in keeping with the Mars mission theme). HI-SEAS isn't the only food-related study NASA is funding in connection with its Mars ambitions. For example, the space agency recently awarded $125,000 to a researcher seeking to develop a "3D pizza printer," which could synthesize a variety of foods using ingredients with a long shelf life. NASA officials have said that putting boots on Mars is the chief goal of the agency's human spaceflight program. NASA is working to get astronauts to a near-Earth asteroid by 2025, then on to the vicinity of Mars by the mid-2030s, as directed by President Barack Obama in 2010.